It is just as difficult for an American home buyer to imagine the energy performance and comfort in a Swedish house as it is for Swedish home buyers to imagine paying for rooms that are seldom used in houses with drafty windows and energy wasting walls. Unlike much of Europe, Sweden shares the American practice of building with wood stud framed walls, but the similarity stops there. Swedish houses are draft-free and employ technology that few builders outside Scandinavia understand let alone offer at an affordable price. 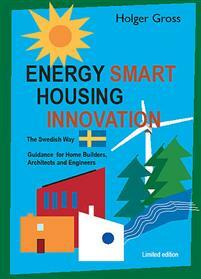 Holger Gross, one of Sweden’s trusted experts on building and a veteran of the forest products industry, wrote this book to introduce the basic considerations of building an energy smart house in Sweden. This translation is valuable because there are not endless practical ways to build energy smart houses. Contained in this book are the technical concepts that Swedes have not only figured out, but tested and proven in the marketplace. Understanding the Swedish accomplishment in building energy performance housing is the practical equivalent of not reinventing the wheel. Swedish builders are given to a level of modesty in line with their national character of preferring the work of self-improvement to evangelism. Many good ideas in housing today owe a debt to Sweden; the Passive House standard, which is gaining currency worldwide for eliminating the need for active heating has its roots in applied Swedish building science. Other ideas that are familiar to green builders such as the blower door test were first done in Sweden. This book is written as an overview, but it is an overview of one of the world’s most advanced house building industries, giving us a glimpse of where we need to go in North America. It belongs in the library of anyone interested in the critical challenge of saving energy and improving comfort in housing. Consider it as an introduction to one of the best kept secrets in green building: The Swedish house.